The consequences of mega-city growth for individuals and societies. ​One case study of a contemporary mega-city experiencing rapid growth. The growth in the percentage of people living in urban areas. This may be due to rural to urban migration as well as natural increase within the cities themselves. A city with a population of more than 10 million people. 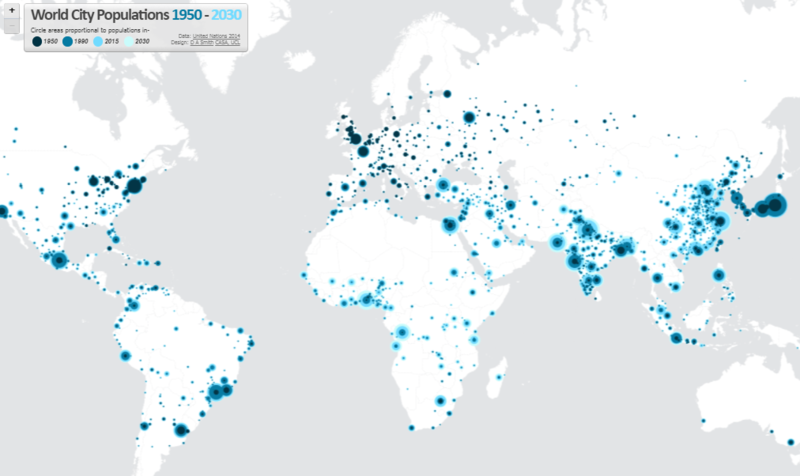 How has the number of megacities increased from 1950 to present day? How has the spatial location of megacities shifted in the same time period? Consider distribution across continents and the division of megacities in high, middle and low income countries. 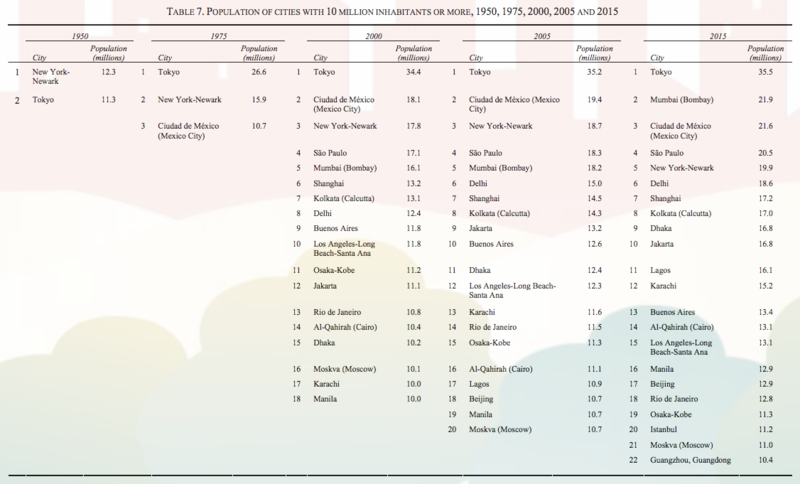 Read the entire United Nations Megacities factsheet by opening the pdf file on the left. Use the resources below to create a case study file which describes and explains the rapid growth of Jakarta and the consequences of this growth for individuals and society. This time series of images shows the growth of the city between 1976, when the population was 6 million, and 1989, when the population was 9 million, and 2004, when the population was 13 million. The images use satellite observations of visible and infrared light reflected by the Earth's surface to enhance the contrast between land surface types. Vegetation, which reflects infrared light very strongly, appears red, and urban areas appear light green. From NASA. 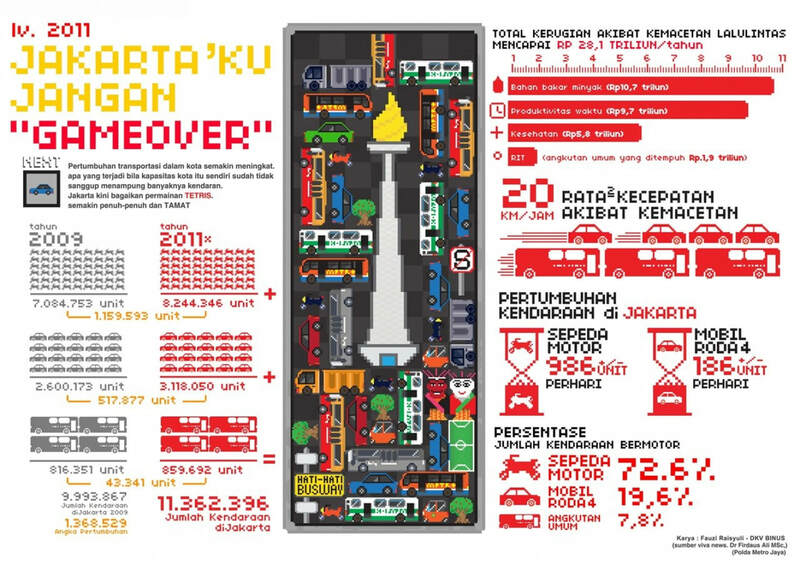 Jakarta is estimated to lose US$3 billion a year because of traffic congestion. According to Jakarta government sources, the average travelling speed on the roads of Jakarta is 5.2 miles per hour. Jakarta remains the largest city in the world without a metro. The construction of MRT started in September 2015 but progress remains slow compared to other megacities. Motorcycle ownership grew from 1.62 million in 2000 to 7.52 million in 2010 and 13.08 million in 2014. People who live in the outskirts of Jakarta can save as much as 30% of their transportation costs using motorcycles to work rather than public transport. A study conducted in 2010 by President Susilo Bambang Yudhoyono’s task force charged with reforming the city’s infrastructure found that 474 new cars and 2,946 motorbikes join the Jakarta traffic jams each day. Jakarta lies in a lowland area with 13 rivers. Urban sprawl means that many catchment areas, green areas and wetlands are now covered in impermeable concrete or tarmac reducing lag times and increasing the flood risk and severity across the city. Floods are an expected occurrence throughout the rainy season and severe floods occur regularly. In 2007, flooding affected 70% of Jakarta, killing more than 57 people and displacing more than 450,000 from their homes. In 2012, floods affected hundreds of homes displaced 2,430 people. In 2013 floods killed at least 20 people and at least 33,502 fled their houses. In 2015, the floods caused estimated losses of $234 million. In August 2016, eight sub-districts in South Jakarta and East Jakarta were flooded affecting 10,538 households. A 2010 study by the Environment Ministry, estimated that 92 percent of the city’s land area is highly prone to flooding, while the remainder is mildly prone. There is a debate about whether Indonesia should shift the capital to another one of the country’s major cities to alleviate the pressures on Jakarta. 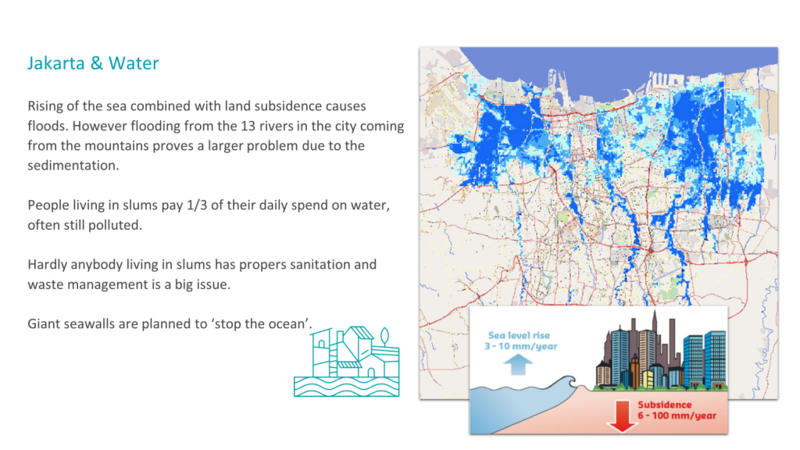 "Land subsidence, where the ground settles gradually or sinks suddenly, continues in the city at increasingly alarming rates mainly caused by intensive deep groundwater extraction. Certain areas of North Jakarta are seeing subsidence in the range of 15 - 25 cm a year. If sustained, these areas will sink 4 to 5 meters below sea level by 2025. 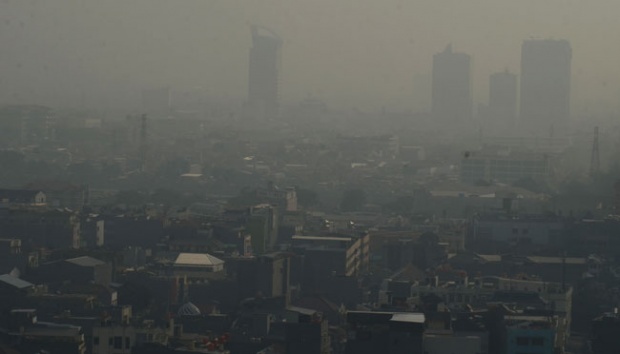 Jakarta is the third most polluted city in the world. The UN Human Settlements Program estimate that 26 percent of Indonesia’s urban population lives in slums, with more than five million slum dwellers in Greater Jakarta alone. Jakarta’s rapid growth has meant the arrival new, mostly poor, residents often moving from rural areas or from smaller cities. Rapid urbanisation has created problems of land and housing scarcity, and as these scarcities increase and housing prices rise, economic factors force the poor to live on land that no one else wants. Legal status - many of the slum areas in Jakarta are illegal. This means that they can be demolished by the government with no notice even after people have lived and developed homes and communities over many years. 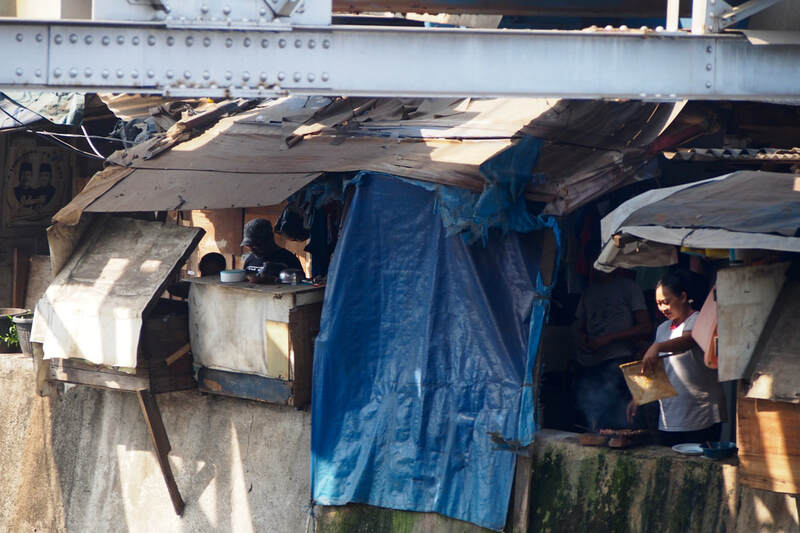 ​Click on the image on the right to open an article describing life in one of Jakarta's slums. Use it to help describe living conditions for the poorest people in the city. 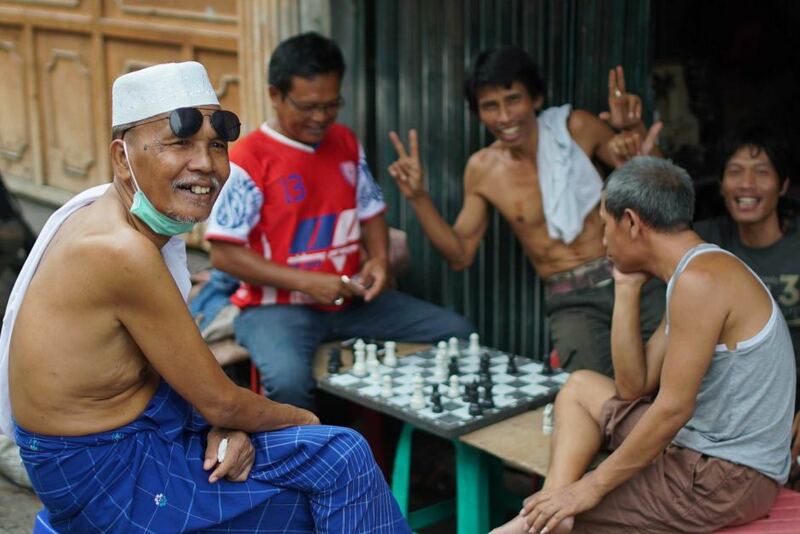 What is your opinion of tourists visiting the slums of Jakarta? The guide Roni says that his tours are about cultures meeting and interacting. To what extent do you think this occurs? Investigate what is meant by Poverty Tourism - how does what you learn affect your views? This article might help. Insufficient investments in infrastructure leave many communities vulnerable to poverty. Only 48% of households now have access to safe water, compared to 50% more than a decade ago. Sewerage coverage exists in only 11 of the country’s 98 cities. Only 2% of city residents have access to centralised sanitation systems.